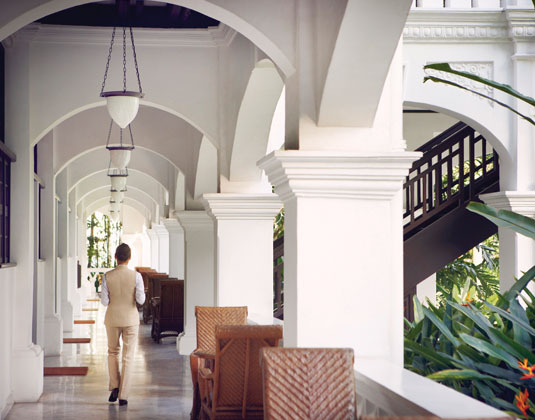 Established in 1887, the most famous hotel in Asia located in the heart of Singapore welcomes guests to a newly restored hotel in 2018. 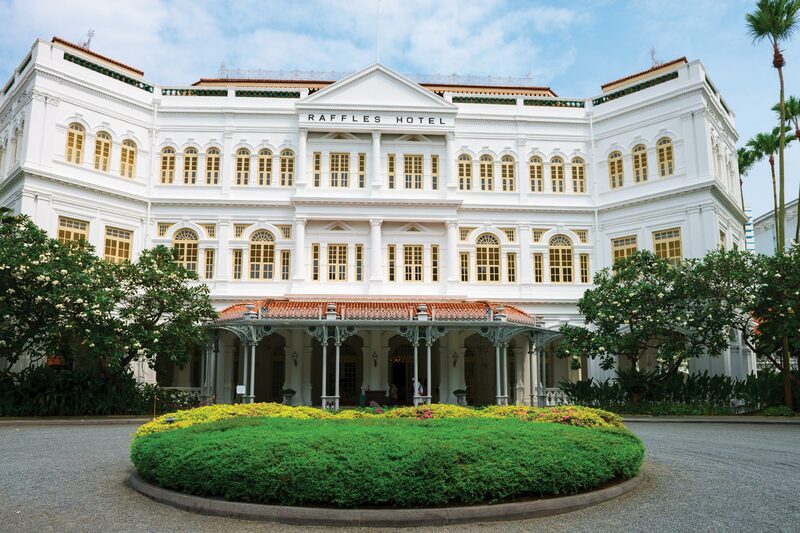 A stay at Raffles is 'an experience to be cherished and talked about for years'. Experience the ultimate in comfort and old-world opulence in the luxurious, colonial suites; spread over four wings surrounded by fragrance-filled gardens, each boast a large airy interior and fine Oriental carpets. After a day of sampling the sights of Singapore indulge in a pampering treatment at the exclusive spa which combines time-honoured traditions and modern day technology to refresh the mind, body and soul. 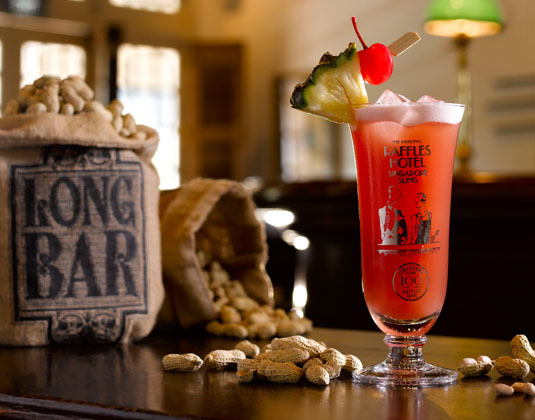 Be sure to enjoy a world-renowned Singapore Sling at the Long Bar, a traditional afternoon tea at the Lobby Lounge or fine cuisine at one of the distinctive restaurants. In large courtyard suites with air-conditioning, ceiling fan, bath with separate shower, mini bar with complimentary soft drinks, safe, separate lounge area and 24 hour butler service. Palm Court Suites which feature elegant period furnishings, the famous Personality Suites (named after personalities who have visited the hotel), Grand Hotel Suites are distinguished by their spaciousness, elegant design and quality of antiques and artworks displayed. Due to Restoration, the Hotel will be closed until 31 Jul 19. 23 Sep-29 Dec 19 02 Jan-31 Mar 20 if you book at least 120 days before arrival. 23 Sep-29 Dec 19 02 Jan-31 Mar 20 if you book at least 150 days before arrival. 01 Aug 19-31 Mar 20 receive Complimentary non-alcoholic mini-bar(daily replenishment), Singapore Sling on arrival, 24 hour personal butler service, 10% discount at the Raffles Gift Shop and Complimentary use of the swimming pool, health club and Raffles Spa Facilities. If you stay in One/Two Bedrooms Grand Hotel Suite also receive Complimentary return airport limousine transfer, Afternoon Tea for 2/4 persons (one/two bedroom) as per stay, A bottle of Champagne and 24hr Frexible Check-in and Check-out. 01 Aug 19-31 Mar 20 receive one bottle of champagne and flowers on arrival as well as special suite set up. 23 Sep-29 Dec 19 02 Jan-31 Mar 20 if you book by 31 May 19 and stay at least 2 nights, receive Late check out at 3pm and S$100 hotel credit per suite per night which may be used to offset incidental charges and services operated by the hotel (Raffles Spa, Raffles Boutique, dining experiences, laundry and limousine).